In the makeup and beauty world, pink tones are used to brighten and make skin appear more even, which is exactly what Smashbox’s pink iridescent hue achieves with ease. Aside from immediately brightening your eyes, it also hydrates and provides your eyes with a new found glow and radiance. It can be worn alone without makeup for a quick pick-me-up, or under your concealer. It’s silky texture allows you to use a minimal amount and still receive results without having your concealer slip or wear off, leaving you feeling fresh. It also provides you with anti-aging solutions such as optical diffusers, caffeine, and peptides. 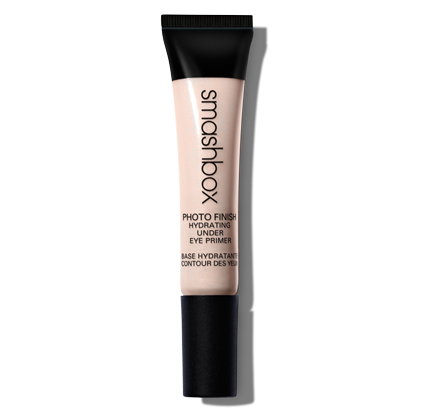 After receiving a gift card for my birthday, I purchased this Smashbox Photo Finish Hydrating Under Eye Primer at my local Sephora for $29.00. I use Smashbox’s Light face primer so I thought I would skim by the Smashbox section and see if I could find something else to add to my collection. Upon reading over the details of this under eye primer, I KNEW I had to try it out. Smashbox claims this product contains 0.33oz in it’s tube, which may sound disappointing for the cost, however a little goes a long way. I love that this primer can be worn as a instant brightener without the need for more makeup. It easily blends into your skin without giving you away that you have any products on your face. I highly recommend this fantastic addition to any one who’s looking for something simple and effective. It’s great for all skin types and it’s light formula makes it a perfect fit for those of us with combination or oily skin, reducing the risk of breakouts or skin reactions. Normally I only carry my makeup staples in my purse; i.e. mascara, pressed powder, lip glosses, etc. But because of how great this primer is, I plan to purchase a second tube just for my purse! *Luckily* I’m an online shopping fanatic and I’ve discovered this same under eye primer is available in a mini travel size on eBay for somewhere around $5.00- $10.00. This *New* product is now an absolute staple in my beauty routine!